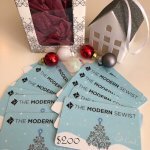 Give the gift of The Modern Sewist! Values from $25 - $200. If you require a different amount, please Contact Us. All Gift Cards are packaged in a pillow envelope and can include a card with your sentiments. Please leave any special instructions in notes when checking out or contact us directly.